#1. Assign someone to take on the task! OK first things first… Create a budget! Promoting your event can be a daunting task but it doesn’t have to be. Attracting people to your event is both a goal and top stressor for event organizers. If you’ve tried every promotion tactic in your playbook, it’s time to get clever. Below are some creative event promotion ideas to help increase your participation level. – Call us for assistance… it’s what we do! Below are the TOP 6 Marketing tips to promote your 5K event. You don’t have to break the bank to promote your event, you just need to have someone dedicated to making it happen. such as Facebook® advertising. For a small races under 300, we suggest budgeting about $150. If you are uncomfortable with social media advertising just let us know and we can help you coordinate this. We can target your advertising to the very demographics most likely to participate in your event. A $50 Fee applies if we are to coordinate this. We can print promo cards to distribute to local fitness centers, shoe stores, etc. Someone just has to distribute them. Encourage local businesses to sign up as “Wellness” Sponsors. Basically they purchase 10 or more entries to distribute to their staff and we then list them as a sponsor. If you can get 10 businesses to participate in this, that’s 100 participants! 20 is 200…. get the picture? We are happy to share details on how to promote this. Just let us know when you have 15 minutes to talk over the phone. Send an email announcement to all past participants to boost registrations. This is automated under the 5Kevents registration portal. If you need assistance, just call us and we will assist. That’s what we are here for. Send a Press Release to the local media. If you need assistance, just call us and we will assist. That’s what we are here for.. Our service fee is $50 and includes writing and distributing your press release. Valpak is a cost-effective way to target our ideal audience. 5Kevents.org works directly with Valpak to expose your event to a wide outreach. Contact 5Kevents.org to coordinate your VALPAK program. Keep in mind we need to commit to Valpak about 1 month before your event. The Sponsorship Pack requires use of our online registration platform. Email us if you would like to receive a FREE sample pack. 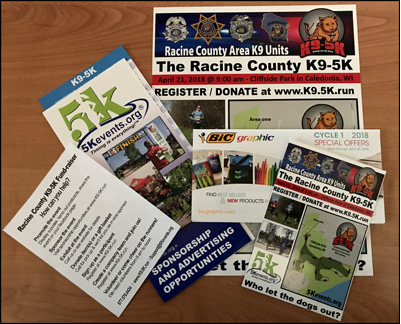 5Kevents.org will customize the 5K promo pack for your needs, then print and ship to you for distribution… but wait there is more! We will also take care of the fulfillment for you by printing all sponsored signage, promotional products, etc. and will have in your hands well before your event date. It’s what we do! It is difficult to attract participants and actively promote and event if you are not centered in your core market area. You team up with your venue, your charity, and your local running clubs, but do not rely on them to be your sales people. Whatever these people do for you is a bonus, but they should never be relied on or a caveat to producing the race. YOU are the reason the race is successful, you have to take full responsibility for every aspect of the run. When producing an event it is imperative that you have someone local actively promoting the event. While you don’t rely solely on the charity or organization to promote your event, the more they help, the higher the turnout. We strongly suggest a minimum of 90 to 120 days. The further out the better. Always budget first time runs around 120 participants. 300 is a common goal but not expected with first year events. 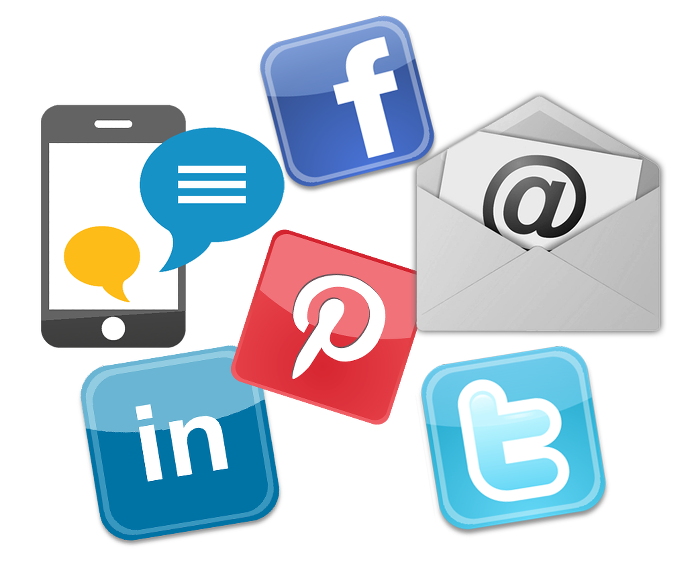 Actively promoting on social media is a huge advantage to maximizing attendance. 5Kevents.org has an intensive social media strategy that will benefit each run greatly. 5Kevents.org will keep you updated as the strategy continues to evolve. The key is to hit your target audience. Posters are great but do they really hit your clientele? It is recommended to not solely rely on posters and most people (not just runners) need something in hand to convert your call to action. Make sure you are dropping postcards at other events in the immediate area beforehand (4 to 8 weeks out). Hit fitness centers, running clubs, shoe stores etc. These are your key markets. Join the local online running clubs on social media? Don’t blast them with emails right out of the gate. Build a relationship with the club, provide feedback and contribute to the blogs with valuable content. Don’t just join them to promote your runs. And don’t be afraid to start running yourself, join a local group and start building relationships. The more you have the more they will talk about the event. Large or small it really does not matter. Contact us at 5Kevents for a unique and powerful sponsorship strategy. Added value, what do the runners get? Anything from a car wash to a gift card is of huge value. Help promote the sponsor via Facebook and social media. This is an extremely simple concept that adds tremendous value and will get people coming back. Medals are not swag. Swag consist of T-Shirts and giveaways, etc. and provide added value to the runners. More than ever, runners want swag. Make sure you are announcing the swag items on your social media and emails. If your providing a finishers medal you still need to recognize the age categories. Serious runners want recognition. 5Kevents offers a unique Recognition Pin for age categories that has been the coveted prize at our events. It’s simple, inexpensive yet powerful. It may be competitive runners, fun runners, runners who live within easy driving distance, runners seeking a challenge, those looking for an easy run or just want to go for a group walk, etc. Build your event around the type of runner you are likely to attract – it may not be someone like you. Do you have a lot of post-race food? Live entertainment? A beautiful course? Valuable raffles? A really cool t-shirt? Think of what makes your race unique and why people will want to run it (not why you think they should want to run it). Include specific contact information in all of your race materials – web site, email, telephone number, mailing address (with zip code). Publish a telephone number that will always be answered – in person or by voice mail. Don’t use “evening only” telephone numbers. Most people call from work. Return calls and emails promptly. List your event on ALL the running portals and do it early! 5Kevents.org has a list of portals to promote your run on such as www.runningusa.com.The best part is we post the event for you! List it and they will come! Packet stuffers, banners, logo placement, product distribution, public announcements, press releases, etc. Provide sponsors with everything you agreed to and give them more. After the event make sure you thank them and let them know of any success stories. Think of additional things you can do for a sponsor – even if it isn’t in your contract. If, for example, you staff a table at an expo, consider distributing sponsor product as a premium for sign-ups. Sponsors will think more highly of you, and be more likely to support your race in the future, if they know you are looking out for their interests. Our team will continue to focus on better ways to promote your events and improve sponsorship. Any input you provide will be greatly appreciated. Keep focused and building your business!